This article is not about Ghandi and the independence of India; is not about hunger strikes and the upholding of civil rights; but it is an attempt to restore to its former heights an overlooked tool for spiritual development‚ recommended by generations upon generations of Holy Fathers and spiritual elders. Upon hearing the word “fast” today‚ one doesn’t think of freedom‚ on the contrary‚ the discipline of fasting is more associated with coercion‚restriction and limitation of choices. This is the primary reason why so many people do not even consider fasting in their development as Christian. From a material point of view however this is what fasting is: we abstain from certain foods‚ or even all foods‚ on certain days. This nearsighted view however is the main culprit in our misunderstanding of this exercise because it only pertains to our material side‚ to our flesh that needs nourishment to survive. Man however is more than just organic matter and his universe expands beyond the bounds of the physical reality into the spiritual realm. If we fail to grasp this important aspect‚ then sure‚ fasting is really unnecessary. But if fasting was so unnecessary than why did Jesus Christ bother to fast in the wilderness for 40 days before He started His visible works in the world? He probably knew something about fasting‚ something that we have a tendency to ignore because its discipline is uncomfortable to our pampered bodies. We mainly reject fasting because we have perverted the purpose of food from nutrition to pleasure. This is not something new‚ this has happened long time ago in p aradise with Adam and Eve that ate out of curiosity and hope for life fulfillment without God‚ not out of hunger. From there on there is an entire history of food abuse all the way to our days. Today we live in a society where 90% of food commercials on TV advertise “junk-food”‚ food that is good only to make us feel happy and satisfy cravings‚ bringing no dietary value: pure pleasure‚ no nutrition. Giving up something so enjoyable is very hard‚ even if it is not good for you‚ let alone if you can justify it as a necessity. Sometimes however‚giving up something we like might be the best thing to do. Giving up something occupying so much on one’s mind opens tremendous opportunities to concentrate on other important aspects of our life. Freed from the agonizing decision about what restaurant we will go next‚ one can pay more attention to other thing that matter‚ like for instance our relationship with God that is blatantly ignored while we spend so much time imagining the next culinary delight. A perfect example of the fruits of such spiritual exercise is St. John the Forerunner and Baptist of the Lord‚ the very protector of our parish. We see him depicted in some of his icons dressed in a torn camel hair robe with a modest and wild appearance but‚ surprisingly‚bearing wings. The wings are an illustration of his ascetic life‚ a life spent in complete obedience to God‚ of renunciation to any bodily pleasures‚ save the bare necessities‚ that made him close to the life of the angels. 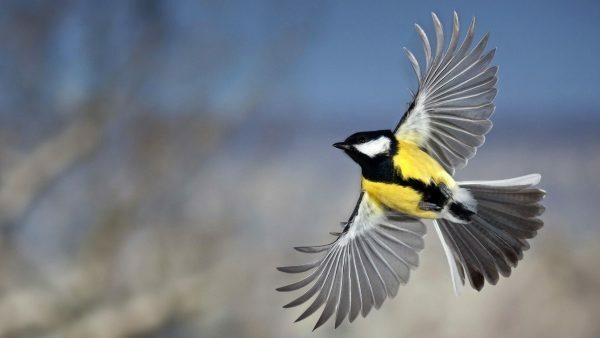 The wings are also a symbol of his freedom from all that is material and the great spiritual mobility that he has received from God as a reward for his ascetic life. God did not force St. John to accomplish any of his ascetic endeavors; John has freely chosen to incline the balance of his life to God‚ and take flight towards heavens‚ unrestrained by the chains of sin or matter. The Great Lent is a journey through the history of mankind‚ a journey from slavery to freedom in which we are called to join not as observers‚but as full participants‚ assuming upon ourselves the responsibility that our new life in Christ is bringing to the table. Growing wings is a choice‚ let us choose right.